Check out these fantastic New Braunfels area vacation rentals sorted by property type. Whether you are searching for a simple condo or larger single family home, we've got all sort of property types including cabins available for your next trip! Enjoy a beautiful backyard with huge deck that overlooks Lake Placid, sitting leisurely, enjoy the views of Texas Hill Country. 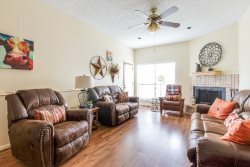 These New Braunfels vacation homes are spacious enough for families to have a BBQ, sit, talk and make lasting memories. Looking for something a bit smaller, but still private? We have quaint cabins for rent on the Guadalupe River that can still sleep up to 6 guests! Browse our inventory of cabins and houses for rent in New Braunfels to find your perfect hill country retreat today! Check out this list of the vacation condo rentals offered by New Braunfels Leasing & Property Management. Several resort properties are available at different locations in the New Braunfels area. Properties are conveniently located close to area attractions and local activities. Condos are fully furnished with everything you need for a great vacation. CW C213 - Comal RIVER VIEW Camp Warnecke Condo. Double Balcony!